During this class, we will paint a picture similar to this one. The Legend of the Dogwood is a heartwarming tale. But it is just a legend. Nothing is recorded concerning the type of trees used in the days of Roman crucifixions. Nor is there any proof that dogwood ever grew in Israel. Nevertheless, the legend reminds us of Christ’s sacrifice. Most who have heard the story think of the cross when they examine the flower—the drops of “blood” on each pedal and the crown of thorns in the center. A closer look at the legend reveals so much more about the tree and about humanity. 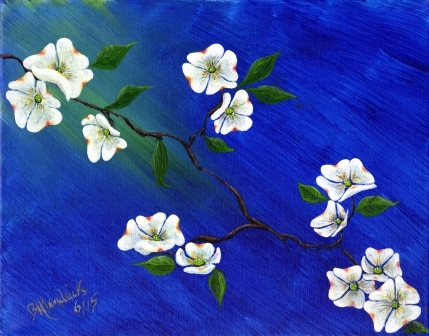 The dogwood, according to the legend, grew strong and proud as a mighty oak in that day. Then something devastating happened. Roman soldiers chopped it down, cut it into boards, and nailed the Lord to it. If trees were capable of grief and shame, the dogwood would’ve suffered as the story goes. Be that as it may, two similarities to Christians exist in this tale of a strong, proud tree. The first is rather obvious. We humans are strong, proud, and boastful by nature. We think we have it all. In our arrogance, we assume we don’t need anyone or anything. We’ve weathered many storms unassisted and grew stronger because of them. Then disaster strikes. Disease “chops” us down. Bankruptcy “cuts” us apart. Death of a loved one or divorce fragments our lives. Sorrow, shame, and guilt reduce us to a withered shadow of our former selves. We cry out, first to anyone who will lend an ear. Then to the only One who can help. This brings us to the second similarity. When we come to Jesus, we expect Him to restore us to our former glory. He doesn’t. Thus, we insist He redesigns us into something even more spectacular. He doesn’t do that. Then, we plead with Him to remove the scars. He doesn’t do that either. We become perplexed, unsure of ourselves, and uncertain of Jesus’ reasoning. Until we realize, our strength comes solely from Him. He doesn’t remove or hide our scars while He takes away the sorrow, shame, and guilt. He lets the marks of our trials remain to remind us of where we were, what we’ve been through, and where we’re going and to reveal to others His work in and through us. Just as the dogwood’s twisted trunk and cross-shaped flowers bear witness to Christ, let our lives, our struggles, our scars bear witness of His goodness and grace. How about you? What areas of your life remain scarred, yet, testify of Jesus’ goodness and grace?